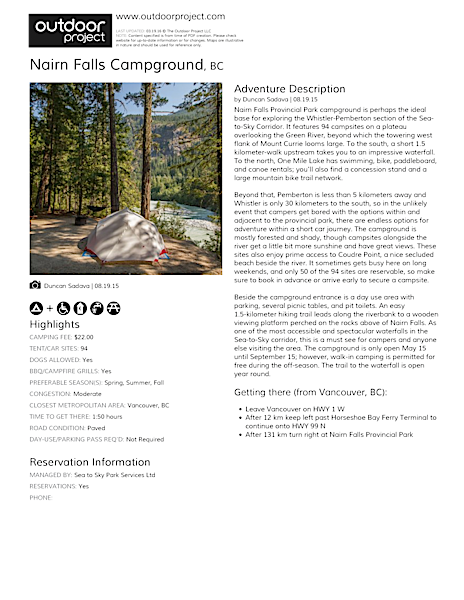 Nairn Falls Provincial Park campground is perhaps the ideal base for exploring the Whistler-Pemberton section of the Sea-to-Sky corridor. It features 94 campsites on a plateau overlooking the Green River, beyond which the towering west flank of Mount Currie looms large. To the south, a short 1.5 kilometer-walk upstream takes you to an impressive waterfall. To the north, One Mile Lake has swimming, bike, paddleboard, and canoe rentals; you'll also find a concession stand and a large mountain bike trail network. Beyond that, Pemberton is less than 5 kilometers away and Whistler is only 30 kilometers to the south, so in the unlikely event that campers get bored with the options within and adjacent to the provincial park, there are endless options for adventure within a short car journey. The campground is mostly forested and shady, though campsites alongside the river get a little bit more sunshine and have great views. These sites also enjoy prime access to Coudre Point, a nice secluded beach beside the river. It sometimes gets busy here on long weekends, and only 50 of the 94 sites are reservable, so make sure to book in advance or arrive early to secure a campsite. Beside the campground entrance is a day use area with parking, several picnic tables, and pit toilets. An easy 1.5-kilometer hiking trail leads along the riverbank to a wooden viewing platform perched on the rocks above of Nairn Falls. As one of the most accessible and spectacular waterfalls in the Sea-to-Sky corridor, this is a must see for campers and anyone else visiting the area. The campground is only open May 15 until September 15; however, walk-in camping is permitted for free during the off-season. The trail to the waterfall is open year round. Waterfall. Bike trails and disc golf course. Swimming hole and river nearby. Close to Whistler and Pemberton. Large campground. Sometimes busy. Some campsites exposed to highway noise.